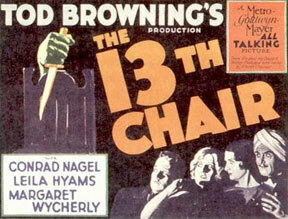 The Thirteenth Chair (1929) is a real curio and Browning’s first sound film. Like a lot of early sound films, it is bogged down with that wax museum-like staging. 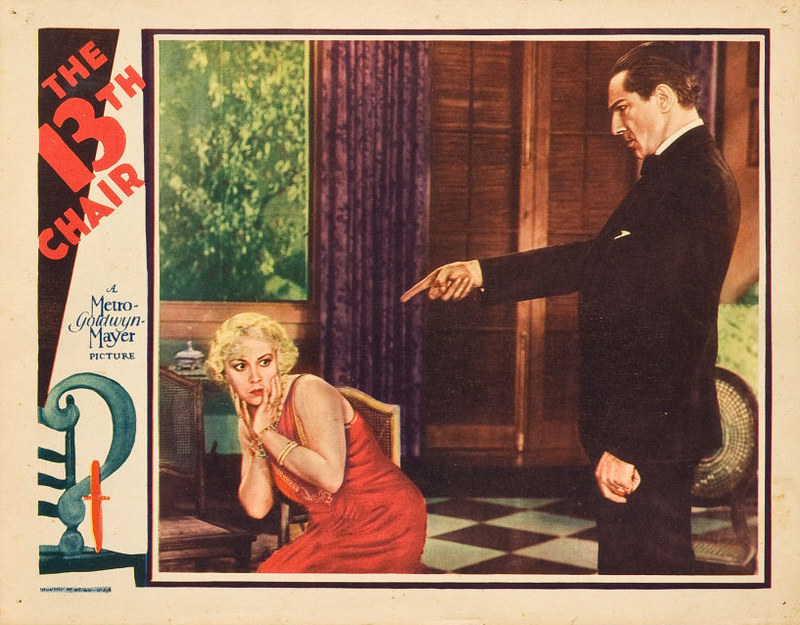 This is yet another drawing room murder mystery, taken from an antiquated stage play, but being a Tod Browning production, the film cannot resist its own latent, deviant infrastructure in the acutely bizarre casting of Bela Lugosi as the well-dressed Inspector Delzante. In the original play, the character of the inspector had a different name and was played for laughs. 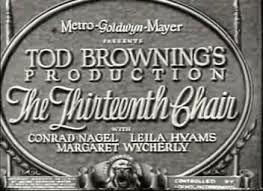 The Thirteenth Chair was an all around testing of the waters type of film, namely, in handling that new invention called sound, which neither Browning nor the production team were comfortably with (all too clearly). 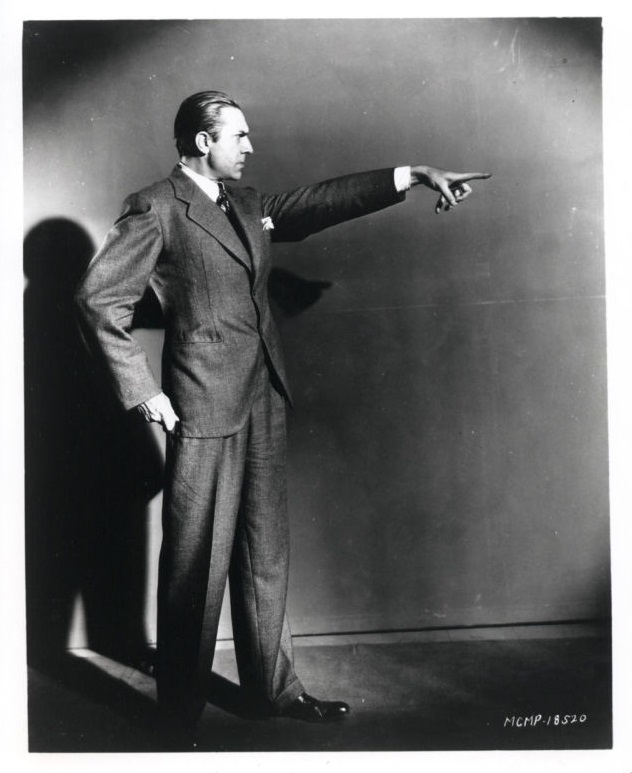 However, the main testing was the upcoming role of Dracula and for that reason Browning grabbed Lugosi, who had made the role a mega hit on the stage circuit. Lugosi’s make-up, with sharply accented eyebrows, is patterned after the make-up he wore as Dracula in the play. His mannerisms are pure vamp, not at all what the role of the inspector originally called for. His first appearance is shot from the back. He is in a police station, dressed from head to shoes in white, but when he turns towards the camera, he delivers the lines as only a Transylvania Count would. Thankfully, Lugosi is wildly disproportionate to the role and serves as an almost surreal red herring to the film. This may have been a test project for Browning, but he had to make it interesting for himself and he did so first with his eccentric casting of the “Living, Hypnotic Corpse” as the inspector. Lugosi beautifully mangles the English language, as per the norm, but his handling of the foreign tongue is much faster clipped than it would be in the 1931 Dracula, which gives lie to the ridiculously uninformed rumor that he learned his lines phonetically. Lugosi had lived in the states and performed the part for years before the film version so the actor’s delivery for Dracula was a directorial choice, as Lugosi indicated in interviews. 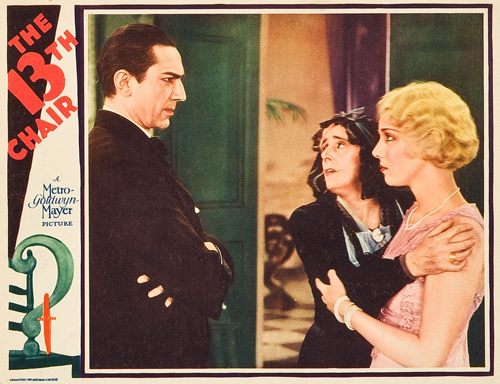 Browning’s work with Lugosi traces an interesting development through the three films they collaborated on. 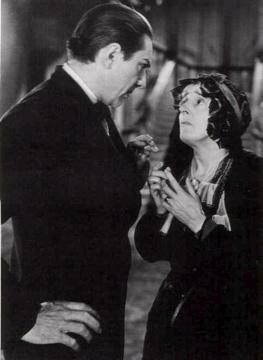 Here, the casting of Lugosi amounts to a deception. Lugosi as Delzante intentionally throws the film off into bizarrely wayward areas. 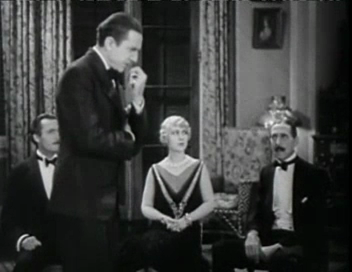 In their next film, Browning’s Dracula often amounts to a parlor trick. 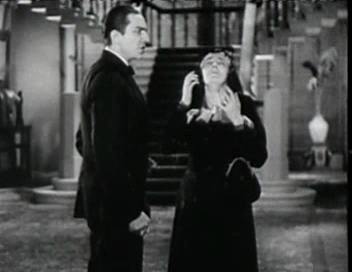 Lugosi as Dracula ascends the stairwell. Renfield follows and sees, to his astonishment, that the Count has magically “walked” through a cobweb without disturbing the web itself. Dracula, like a leering magician, grins diabolically, issuing an disconcerting “come forth.” The collaboration climaxed in Mark of the Vampire (1935). In that, Lugosi is half of the quintessential, crepuscular goth couple (and an incestuous one at that). However, it is merely an elaborate hoax. One suspects Mark was Dracula as Browning intended. 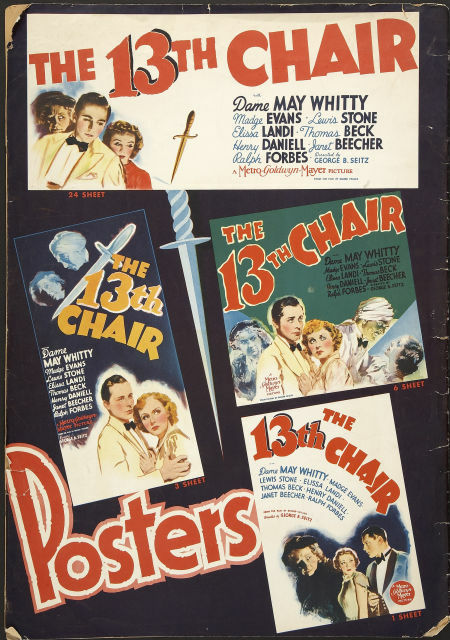 The Thirteenth Chair is replete with eccentric dialogue, delightfully of its time, “So that’s the bee in your bonnet!” says the bland protagonist to his love. John Davidson is more interesting as the doomed Wales. 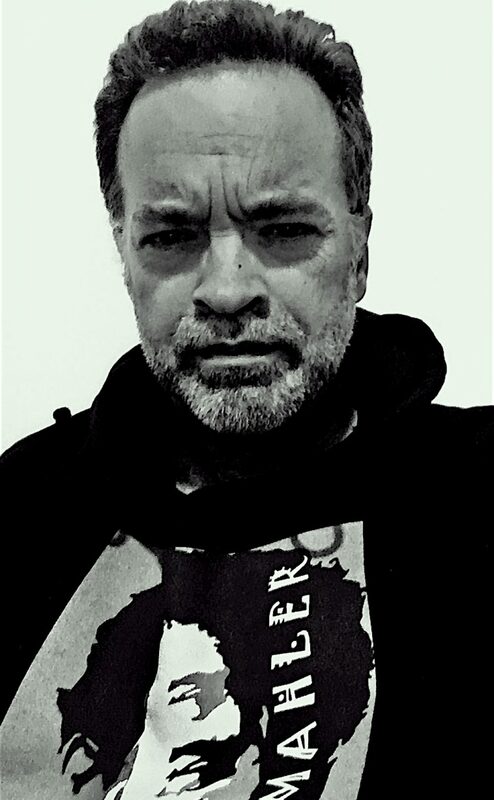 Davidson competes with Lugosi in undead-like delivery. Unfortunately, Davidson gets offed too early in the film, but not before some entertaining eye rolling. Wycherly as the honestly fake spiritualist reprises the role she played on Broadway. Wycherly could be the catalyst for a Browning self-portrait. She is the grand deceiver who eventually lets the audience in on the deception. Browning would repeat this theme in his apt curtain call, Miracles For Sale (1939). Serious awkwardness mars this film, a product from that transitional period from silent to the new, imposing medium of sound. 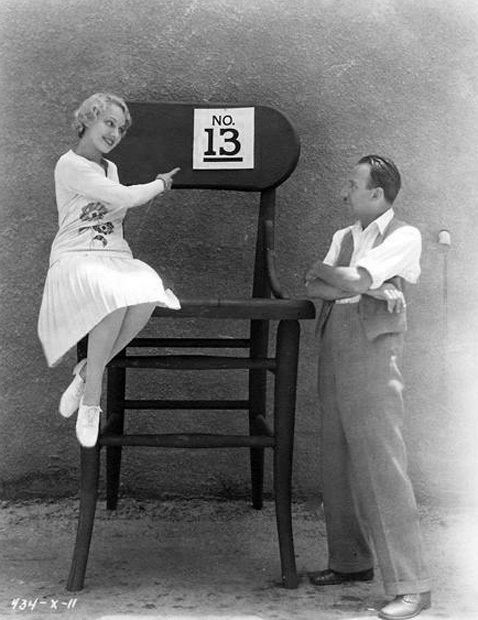 Because of that awkwardness The Thirteenth Chair is not Browning in best form, but he still manages to make it a curiously personal, queer con. Two murders, one committed with all the lights out, a phony medium, a series of séances, a mysterious manor, stolen love letters, and potential blackmail all add up to standard Browning fare, with an extra oddity or two, two Helens that is. This entry was posted in BLUEMAHLER'S WORLD OF SILENT CINEMA, Film Reviews and tagged Bela Lugosi, John Davidson, Margaret Wycherly, Tod Browning by Alfred Eaker. Bookmark the permalink.